In Hide Outlook's default folders, I show you how to hide (or delete) the folders Outlook creates in the default data files. If you want to keep the folder but give it a new name, you can do this as well, using either MFCMAPI or OutlookSpy to edit the folder name. Before using MFCMAPI or OutlookSpy to edit a Personal Folder (pst), you should make a copy of your data file! While these steps are safe to use, it is very easy to have an "Oops, did I do that?" moment and lose your data. In this tutorial, I'm going to use MFCMAPI to change the folder names. You'll need the 32-bit version if you use Outlook 2007, or Outlook 2010 and up in 32 bit. The 64-bit version is for use with Outlook 64-bit (NOT 64-bit Windows). After downloading MFCMAPI, double click on it to run. Double click on your data file. If you have more than one data file, the top entry should be your default. Locate the folder you want to rename. You can change the display name by clicking on it twice and editing the name. Close the window and return to the main MFCMAPI window. Select Session > Logoff and return to Outlook. These instructions rename Calendar (and the companion Tasks folder) folders created in Outlook.com mailbox when syncing with Outlook 2013. When you edit the folder names in an Outlook.com / Hotmail data file, the change is made only in the local folder. It does not sync to the server. Removing the account from Outlook and adding it back will restore the original folder names. The default Task and Calendar names Outlook 2013 uses for additional calendars created at Outlook.com uses the Calendar name for Tasks and adds a  to the Calendar name. You can edit the calendar names to maintain consistancy, with the same calendar name online and in Outlook and use "Tasks - Calendar Name" format for the tasks folder. In the Calendar online, rename the Calendars, adding a 1 to each Calendar name. Open Outlook, or if open, do a send and receive to refresh the calendar names. 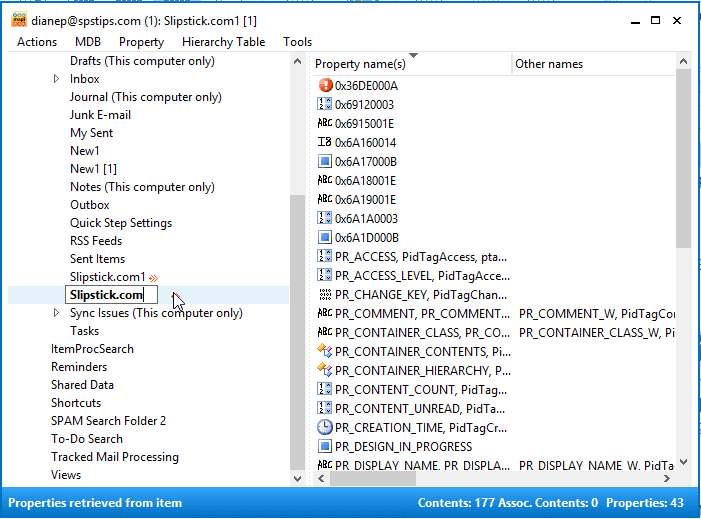 Double click on your Outlook.com data file. Locate the Calendar folder you want to rename. Change the Calendar display name by clicking on it twice then removing "1 " from the name. In Outlook.com online, remove the 1 from the calendar names. Initiate a Send and Receive. The Task names change to "Task - Calendar Name" format. Remember: When you edit the folder names in an Outlook.com/Hotmail data file, the change is made only in the local folder. The names do not sync to the server or to other profiles using this account. If you delete the data file or remove the account from Outlook, Outlook will create the original names, with  behind the calendar. Also, I should clarify. I am on a secure Exchange server and cannot use the method listed in the article above, hence my rant. I want to remove those irritating "search" folders that land in middle of my folder organization when I setup a new PST for archiving. Why MS doesn't understand that needs to be an option to hide or remove is beyond me. And if not hidden, then at LEAST put the system default folders like "search folders" at the top or bottom of any given folder. Sheesh, This irritates me every day when I am sorting and archiving emails for retrieval later. What version of Outlook are you using? Search folders should always be at the end of the folder list (in a specific pst). The other defaults - inbox, drafts, sent, drafts will be at the top. If using 2013/2016, you can turn A-Z sort off and drag the folders around, but search folders should always be at the bottom. You are using IMAP and marking the messages for deletion. There should be a purge button on the Folder tab that will clear them up. After purging, expand Purge and click Purge options and look on the advanced tab - try the bottom option to purge when changing folders. The /resetfoldernames worked! Thank you for that! Was worried I'd have to delete the profile and start over. He has about 15 Mailboxes and wasn't looking forward to redoing them all! I have a user whose Inbox name got changed. So instead of "Inbox" it says "jsmith@blahblahblah.com" Is there anyway this can be changed back or do I have to delete the profile and start over? The inbox was renamed or the top level folder (where Outlook Today is) ? If it is the Inbox, try restarting Outlook using the /resetfoldernames switch. If that doesn't work and you can't rename the Inbox, you'll need to make a new profile. Why is it that Microsoft constantly drops the ball on these stupid little issues. They may not be a priority but they are certainly important to us!